Approximately one million years ago when the Southern husband and I were young and foolish, we had a lot less, well, stuff than we have now. We had one television, one car, one teeny antique house and no hound dog. We didn’t have Iphones or digital cameras or laptops. (Neither did anyone else…we are talking the Dark Ages here. We are talking pre-Internet. We are talking phones with curly cords. ) One thing that we DID have, however, was a very fine cast iron cooking pot, which has somehow escaped over the years. We loved that pot, and among other things we made this wonderful Greek stew over and over and over in it, so whenever I make it these days it zaps me back to those olden days. Here’s how I looked back then. 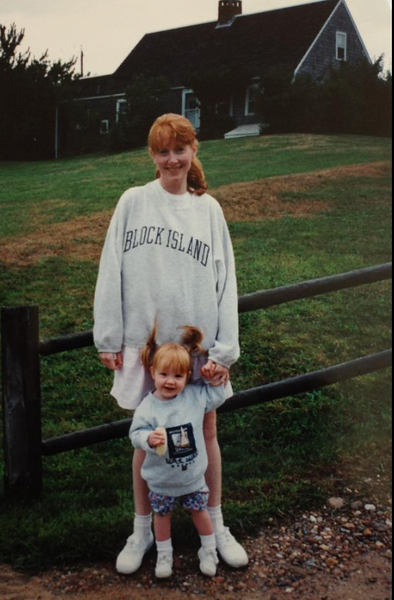 A lot more hair, a few less pounds and one adorable toddler that I hung out with a lot. Here’s the Southern husband. 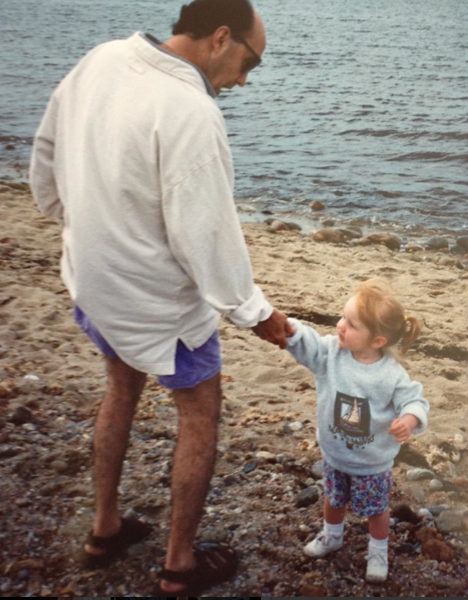 Also more hair, he annoyingly weighs EXACTLY the same now as he did then, and there’s that little sweet pea again. Anyway, I’ve since acquired a La Crueset dutch oven to make this family favorite in, and it still tastes just as exotically wonderful as it did back in the days when we were eating it at our wobbly first kitchen table. It’s official name is stifado, and it is traditionally made with lamb, but since lamb was outside of our budget back in the day we made it with good old beef chuck and it turns out just fine that way. 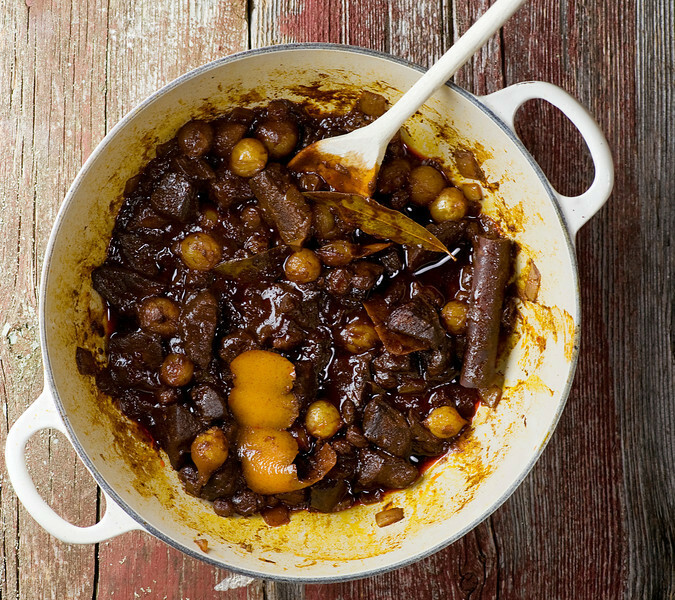 What sets this stew apart from the more traditional varieties are all the simply lovely things it cooks with: cinnamon sticks, red wine, balsamic vinegar, raisins, orange peel, cumin and a few other delightful things. Instead of the traditional carrots and onions this stew features tiny white onions, and when you serve it you scatter some pine nuts and feta cheese on top. I told you it was exotic! The result is a spicy, flavorful pot of deliciousness that will warm you up to the bottom of your toes. And for me, it will take me down memory lane to that time when Facebook was that paperback book you spent quality time with during your first semester in college (all you young-uns can email me and I will explain.) So here’s one of my family favorites – what’s the meal that takes YOU back across the years? Heat oil in your favorite heavy stew-making pot over medium high heat and sear the beef until browned on all sides. Remove beef and set aside. Add onion to pot and stir for one minute. Add garlic and stir for another minute. Add wine, vinegar, sugar and tomato paste and stir until combined. Add spices, raisins, orange peel and meat and stir to combine. Bring to a simmer, turn heat to medium low, cover and cook for one hour. Add onions, stir and cook for another hour. 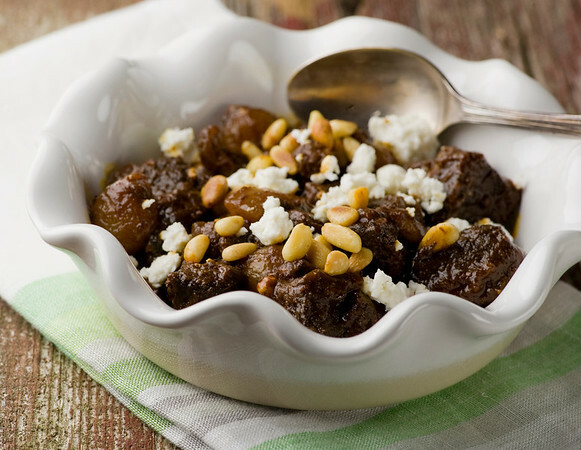 Serve garnished with a little feta cheese and pine nuts. Homemade ravioli! My mom would make dozens and dozens of ravioli in the summer when she could also make quarts and quarts of tomato sauce, all with tomatoes and herbs and onions and garlic from our garden. I can’t remember a time when we didn’t feast on those homemade ravioli and sauce. Wow. I’ve never like anyone else’s ravioli, ever. You know, seeing this, I was thinking that it would be ever so tasty rolled up in some flatbread with some yoghurt. ;) I’ll do that with anything and everything, if you let me. Homemade ravioli – now that is something I’ve never tried, but it sounds so amazing! Awww love that red hair among generations! You are both adorable! I am currently stuck on the fact that I own neither a Dutch oven NOR a cast iron pan. I sometimes wonder what is wrong with me. Turkey tarts is the meal that takes me back to family holidays. Dad said it was the only real reason for roasting a turkey in the first place. Leftover turkey cut into bite-sized pieces, mixed with leftover gravy and sliced pimento-stuffed green olives. Roll out pie dough, cut in circles with a Revere Ware saucepan lid. Place filling on 1/2 the circle, moisten the edges, and fold the dough over, crimping it with a fork. Cut a few slits in the top. Bake in a 350 degree oven until golden. I think this is hands down my favorite meal in the entire world. The recipe is from the Woman’s Home Companion cookbook. My two sisters and I made a huge batch this Christmas. Wow! I can almost taste this from your mouthwatering description – sounds amazing! I thought stifado was made with rabbit in Greece? You could be right – I did a little research and I mainly saw lamb, but anything is possible! This sounds great, but were you into the Ouzo when you wrote it? A “teason” of cumin? A “teasonn” of ground cloves? LOL!!! Or is this a measure with which I am not familiar? LOVE all your recipes and stories as always, and YOU LOOKED …and LOOK….MAHVELOUS!!! Yay! I’ve been thinking about this all night. It’s chilly down here in NC, so THIS is what’s for dinner. I have all the ingreds AND the Dutch oven. Woohoo! Stifado is one of our favorites. Incredibly good and I’ll probably take the opportunity to eat the right both one and two times in Greece when I go there with my two grand children a week.